The First Baptist Church of Hudson on the corner of Greeley Street and Windham Road in Hudson Center was organized May 1, 1805 as “The Church of Christ in Nottingham West” by vote of an ecclesiastical council called for that and one other purpose. The council met at the home of Deacon Thomas Senter on what is now the Old Derry Road. Deacon Senter’s home was in that part of Nottingham West (now Hudson) which had been within the town of Londonderry and since annexed to Nottingham West. A group of some 65 men and women petitioned to be “set off” from the Londonderry church in order to form a “distinct” church. The reason was one of convenience of travel as the homes of these persons were scattered and somewhat distant from the Londonderry Church. The second purpose of the ecclesiastical council was to ordain Brother Thomas Paul who had been called by the Londonderry church. For several years afterwards, the Baptist Church did not have a settled pastor; Rev. Paul was one of a number of pastors who supplied the pulpit. Rev. Paul was an African American preacher of great ability. He later became a minister of the First African Baptist Church of Boston. At first our church met in the North Meeting House which was owned by the Presbyterians and located a few roads east of the present church near the Wattannick Grange Hall. In the winter many meetings were held in homes as the building had no bell or belfry, no stove, no chimney, and no heat! Foot stoves were used in the sleighs while traveling to meetings and then carried into the meeting house. In 1811 the Baptist Society was organized and the North Meeting House was purchased from the Presbyterians. Interest in having a more convenient house of worship began about 1839. Two lengthy services of almost two hours each were held each Sunday. As the Baptist membership grew, it became more necessary to build a church. Reuben Greeley deeded the lot on the corner of Greeley Street and Windham Road to the Baptist Society. There was an existing building on this lot; it was moved easterly on Windham Road and became part of the Dr. H.O. Smith house. The moving bill was $40.60. The sanctuary of the present building was then erected in 1841 and dedicated in 1842. After which the North Meeting House was then deeded to the town. 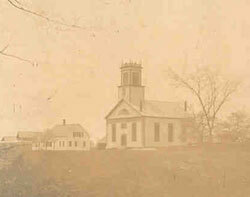 The new meeting house, on the corner of Windham Road and Greeley Street consisted of the sanctuary and a two-stage steeple. The top of this steeple was a large cupola with spires representing Matthew, Mark, Luke and John. The sanctuary included four walls with windows on probably three sides, a balcony, chimney, one or two wood burning stoves, a platform, a pulpit set, and pews. The pews were of the square box type and had been carried over from the North Meeting House. Pews were individually owned and passed down by deed. Likely the balcony was open overlooking the sanctuary and enclosed later to conserve heat. You may ask about the steeple. It was part of the early building as evidenced by the bell. The first bell, donated by Deacon Moses Greeley, cracked and was replaced in 1847 by the present bell. At first stringed instruments were used to provide the music. They were replaced by a pump organ about 1850. At that time a young doctor in town, Dr. David O. Smith, also served as music director for the church. 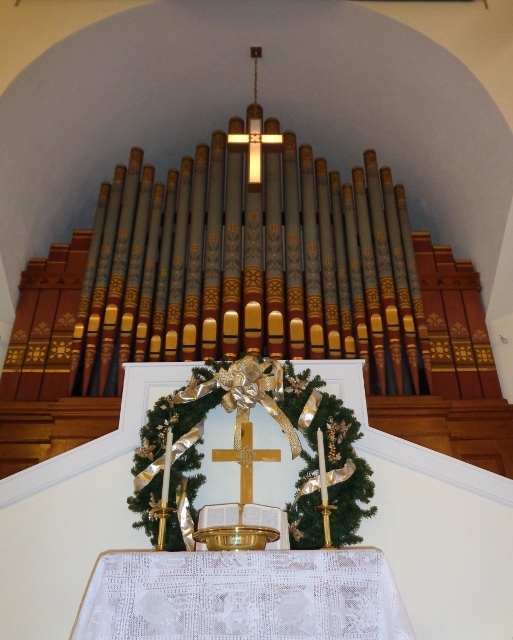 The first major changes to the sanctuary occurred in 1888 when the church received a gift of the Woodbury and Harris tracker organ from Dr. David O. Smith. This fine musical instrument was given in honor of his daughter, Martha, who was an accomplished organist and pianist. The original cost of this organ was $1,820! In order to house the organ an alcove was added to the front of the sanctuary. The new organ became the centerpiece of the sanctuary with the large archway for the pipes and the console for the organist. Behind the scenes were doors through which one could enter into the organ. The doorway on the left side was most important. As the church did not have electricity a “blow boy” would enter in order to exercise a handle to pump air into the organ pipes. This practice continued into the 1920’s when the organ was electrified. Other improvements made at the same time included colored glass windows, a new pulpit set, an updated platform, and new modern pews. These pews were said to be of the newest type available at the time. A large gas chandelier hug from the center of the ceiling. The metal ceiling of today was added about 1905. In 1891, 50 years after the building was erected, the tradition of an annual Roll Call of members was started. This Roll Call occurs on or about the anniversary date, May 1, of each year. At this event the name of each church member is called and responses are made, generally with their favorite verse of scripture. In 1897 the exterior of the building as we know it today was completed when the 2-story vestry was added to the rear of the church. This was a gift from the Smith and Haselton families. Additional space was added in 1968 when “Project Excavation” placed a new foundation under the sanctuary, making an additional room for the Church School, meetings, and for a new larger kitchen and dining room. This area was named Memorial Hall as many gifts helped to finance and complete the project. Before we ‘fast forward’ in time let me make a comment about baptisms. Prior to 1900 there was no baptistery within the church. Baptisms occurred at a local lake or brook; Ottarnic or Robinson Pond and perhaps Glover or Merrill Brook. Our church has had 3 baptistries. The first installed about 1900 and the third C1965 to the left of the organ as a memorial to Deacon Arthur M. Smith. The mural for the baptistery was painted by Phyllis Moore. 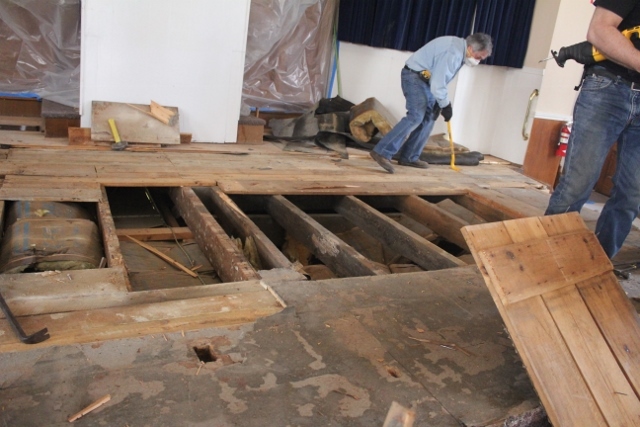 For the past 15 plus years the church has engaged in a number of building improvements; some of which paved the way for more visible renovations to the sanctuary. The earliest of these was the replacement of the steeple. In 2000 the original steeple on the 159-year-old building was removed. This decision was made after much thought, and many attempts to tighten up, repair, and secure the old structure which had deteriorated badly over the years. As funds and an able contractor became available the steeple was replaced in 2006 by a slightly smaller but visually identical steeple. The second major improvement came with the restoration of the colored sanctuary windows; again, as money became available each window was removed, restored, and returned to its original place. The third improvement was to upgrade our heating system and the installation of central air for the sanctuary. These improvements were completed in 2014. It was now possible to plan for more visual enhancements to the sanctuary. A sanctuary refurbishment committee was organized by the congregation. The first project was to update and enlarge the platform. After a planning period and architectural drawing of the proposed platform construction work began in early April of this year. The goal was to enlarge and modernize the platform, improve accessibility to it and the organ console, and to make it structurally sound. The basic construction work was done by a small but faithful group of volunteers from the church and the community under the leadership of Richard Tassi as architect. A local contractor was used for the finish work of the platform. Once the work on the platform was well underway the church came together to make a decision on seating. After discussion of options and costs the church members voted to replace the 130-year-old pews with individual navy-blue pew chairs. Once the decision was made individuals donated toward their purchase. These chairs replaced the wooden pews which were placed in our sanctuary in 1888. The wooden pews have since been donated to the Seabee museum in North Kingston, RI. In the past few weeks the newly refurbished sanctuary has come to life. The platform is complete, the new pew chairs are in place, the ceiling and walls have a fresh coat of paint and the sound system is up and running. 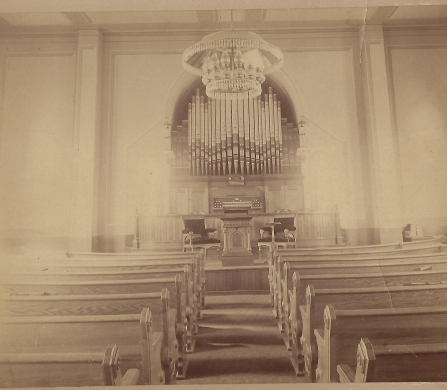 When the sanctuary was re-dedicated in 1888 the new organ became the center piece of the sanctuary. 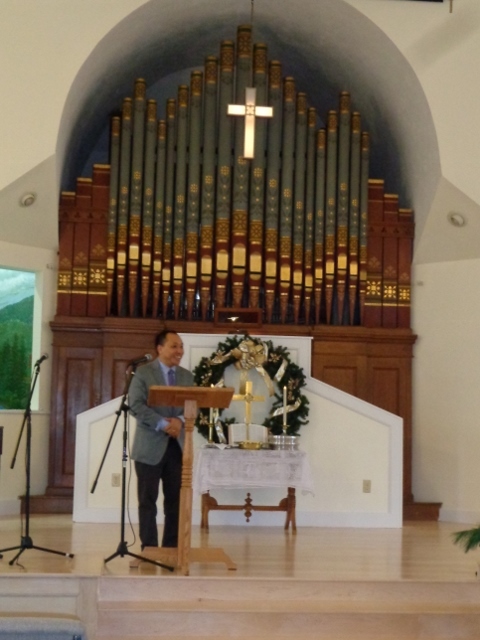 During the morning service on December 16 the sanctuary was re-dedicated. The 130-year-old Woodbury and Harris organ donated to the church by Dr. David O. Smith in 1888 remains the center piece of the sanctuary.